Experience true joy now and always. You have heard Jesus voice and responded to His invitation to peace and hope. With scripture and personal reflections, the #1 New York Times bestselling author Sarah Young, brings Jesus message of joy for today and every day. Life today is full of difficulties loss, sadness, fear. In the midst of these challenges, joy often feels impossible or out of reach. But Jesus has more for His followers than a life of striving, pain, and discontent. He offers life abundant, life to the fullest, life brimming with joy Jesus Always, the brand new 365-day devotional from bestselling author Sarah Young, was written as part of Sarah Young s exploration of the promises of joy in scripture. Written as if Jesus Himself is speaking directly to the reader, Jesus Always invites you into a new way of living a life of joy. 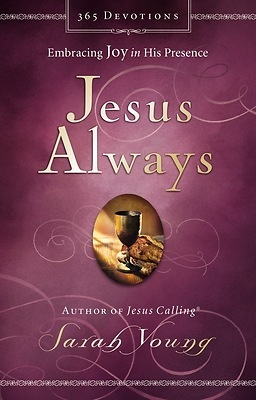 People often buy multiple copies of Sarah Young products, which makes this a truly unique book that appeals to both self-purchases and gifts often at the same time "